Veteran broadcast journalists Anthony Taberna and Jorge Cariño are your new weekend buddies as they head to the streets to listen to the stories and concerns of regular people on the new ABS-CBN Current Affairs program “Pareng Partners,” every Saturday afternoon at 5:15 pm starting July 28. The “Umagang Kay Ganda” anchors, who both began as Radyo Patrol Reporters in DZMM 630, are switching from reporting big news events to searching and putting spotlight on the sentiments of ordinary Filipinos. On the premier episode on Saturday (July 28), Anthony and Jorge head to Mandaluyong and Nueva Ecija to hang out with families and talk about their take on family and family life. On the premier episode on Saturday (July 28), Anthony and Jorge head to Mandaluyong and Nueva Ecija to hang out with families and talk about their take on family and family life. In Mandaluyong, folks in Barangay Addition Hills give their opinion on having few or many children, while residents of Nueva Ecija compare living in the province to living in the city. As a bonus, the “Pareng Partners” also catch up with Kim Chiu, Ethel Booba, and Xander Ford to talk about online bashing, how it has affected them, and how they eventually got through it. For Jorge, who started as “Radyo Patrol 27” in the radio before venturing into TV news reporting on ANC and ABS-CBN, “Pareng Partners” is a way for him to return to his roots in the field, as he gives people a space to share their experiences, air their concerns, express their opinions, and have their voices heard. “As a journalist, I’ve realized that the most brilliant minds, caring hearts, and brave souls are often found in the regular people you meet every day,” he said. “With this show, we let the people tell the stories themselves and hope they inspire others as well,” shared Jorge, who’s covered the police, Senate, and Malacanang beats, as well as major news events like the Oakwood mutiny. Anthony, who followed Jorge in the DZMM as Radyo Patrol 28 before making a name for his hard-hitting reports and commentary both on radio and TV, says the program’s relaxed and informal atmosphere will encourage the people to have the confidence to speak their mind freely. “It’s just like we are having a conversation over a meal, with everyone getting a chance to talk about his thoughts and life,” he said. 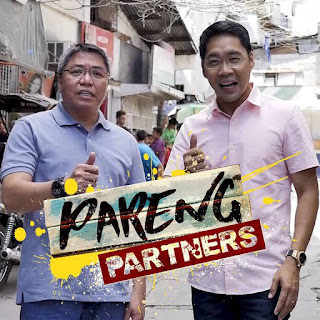 Spend your weekends with Pareng Tunying and Pareng Jorge on “Pareng Partners” every Saturday, 5:15 pm before “TV Patrol Weekend” on ABS-CBN and ABS-CBN HD. Watch online via livestreaming or on demand on www.iwantv.com.ph or skyondemand.com.ph. Follow “Pareng Partners” on Facebook and Twitter (@ParengPartners). For updates, follow @abscbnpr on Facebook, Twitter, and Instagram or visit www.abscbnpr.com.